A new drone from Parrot has the potential to help. Outfitted with a thermal camera, the Bebop Pro Thermal can fly over devastated areas and feed a live image back to an app, providing up-to-date status information and identifying hot spots -- including the heat given off by a survivor's body. Parrot announced a pair of new mid-range professional drones on Tuesday. The two devices have very specific jobs and are meant to fill in a need between consumer drones and pricy commercial offerings. 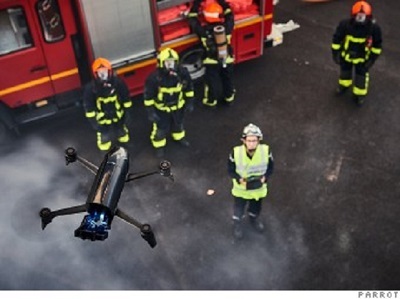 The $1,500 Parrot Bebop-Pro Thermal is for construction, inspection, and public safety workers. In addition to search and rescue, its two cameras can be used to see where heat is escaping from a roof, or what areas are still too hot after a fire. The company is also releasing a drone for farmers with mid-sized crops. Small enough to fit in a carry-on suitcase, the $5,000 Bluegrass drone uses a front-facing camera and built-in sensor for precision agriculture. It can fly for 25 minutes on one charge, covering 30 hectares of land. The drone feeds footage back to a companion app and can tell a farmer if a crop is healthy. It can even be used to keep an eye on livestock. Parrot (PAOTF) is a 23-year-old French technology company that has shifted almost entirely to drones in recent years. It's also investing heavily in innovation -- of it's 700 employees, more than half are working in research and development, according to the company. It is mostly well known for its consumer drones — fun and affordable quadcopters that can be used to shoot video and take photos. It also makes commercial drones including fixed wing unmanned aircraft. Those devices typically cost more than $10,000 and are used by large companies, like industrial farms. Now the company is trying to appeal to commercial operations that aren't big enough to justify dropping that much money on larger, more elaborate devices. The new line is priced at $5,000 and under, and is meant to be as easy to use as consumer drones while including powerful cameras and software like the professional options. That price point could be especially useful for public safety agencies, which don't have as much budget as large corporations. Now the company is hoping a drone built just for those kinds of tasks can take off, and maybe even save lives.